Last month, we introduced you to one of our Mentorship Manager, Josie Faccini's, first mentees: Micaella Jazz A. Clemente. This month, we've received a fantastic update from Jazz: she's earned a position with Crawford, Smith & Swallow in Niagara Falls! This new position will allow Jazz to gain the Canadian experience she requires to achieve her Charted Professional Accounting (CPA) license in Ontario. Jazz was paired with mentor Justin De Caire, a professional accountant at MNP and also one of NWPB's own board members. Alongside their partnership, NWPB worked closely with their EO partner, Niagara Falls YMCA, to help Jazz find meaningful employment opportunities in her field. Ultimately however, it was Jazz who created her own success through her hard work and persistence. We thank Jazz for letting us be part of her story, and we hope to see many more success stories like hers come out of NWPB's Mentorship Program. Congratulations, Jazz! If you would like to learn more about Jazz, we encourage you to visit her LinkedIn Profile. Are you a newcomer to Niagara interested in finding a mentor to assist you in establishing your career here in Canada? 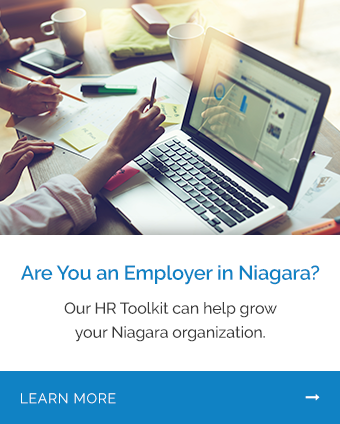 Alternatively, are you a local professional interested in contributing your expertise to the growth of Niagara's workforce by mentoring an internationally trained professional in your field? We invite you to connect with our Mentorship Manager, Josie Faccini, to start your mentorship journey today.